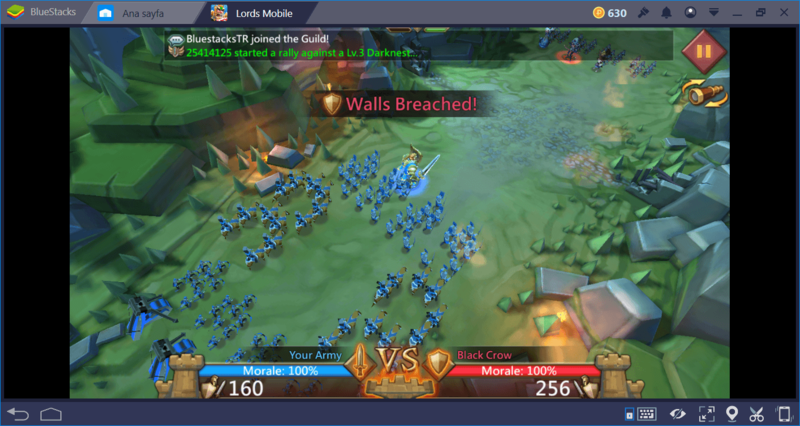 Troops are the key to success for attacking your opponents and defending against them: A well-trained army will bring you victory in Lords Mobile. However, especially for beginners, troop management may seem a little “complex” since there are different tiers for troops and the whole system works like a rock-paper-scissors game. Do not worry: We are here to guide you and show you how to select best troops for a specific goal. 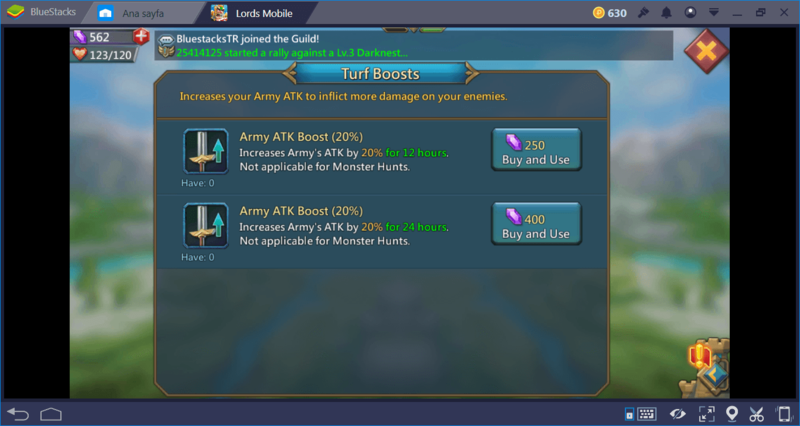 In this guide, you can find everything you want to know about troops in Lords Mobile. Let’s start – there is a kingdom out there we need to conquer. 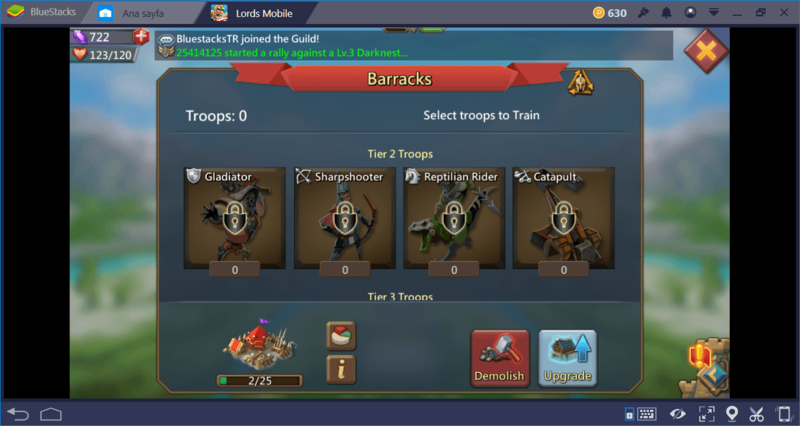 Tier 2 troops require a level 9 Academy to unlock. 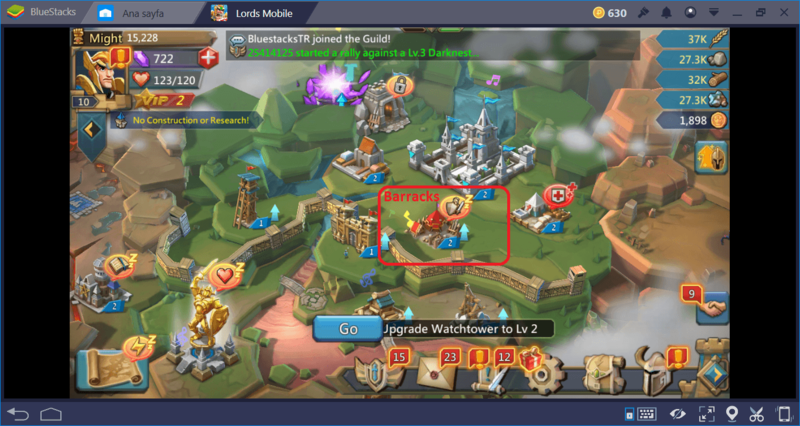 Tier 3 needs a level 17 Academy. Lastly, you need a level 25 Academy to unlock Tier 4 troops. 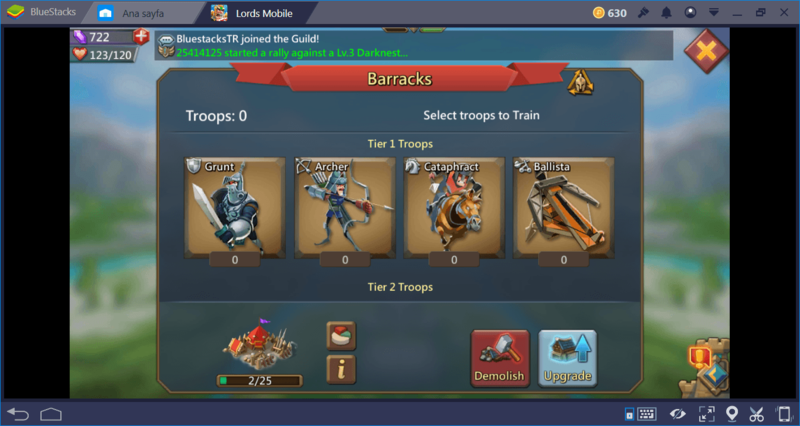 With each tier, resources required to train the troops also increase. To give you an idea, Tier 1 Grunts require 50 Food/Timber/Ore to train. A Tier 4 Heroic Fighter, on the other hand, will need 1.000 Food/Timber/Ore and 500 gold. This means, for example, the best troop type to defend against Ranged is Infantry units. So if you are seeing an army of Archers, use your Grunts against them. Or, if you are planning to attack against an army of Reptilian Riders, Sharpshooters will be the best option. Siege troops are weak against any other troop types – they are only strong against Walls and Wall Traps. 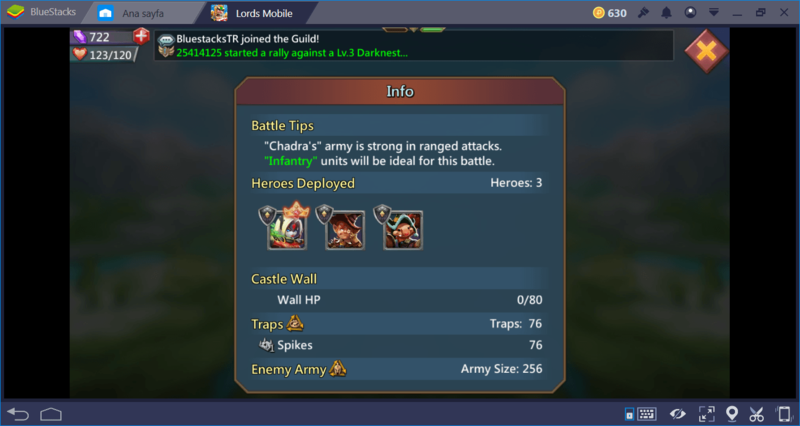 All other troop types, however, are weak against Wall Traps. This is a simple and straight-forward system: While attacking the castle walls, use your Siege troops. While attacking other troops or defending against them, pick the one that counters your opponent. The battle scenes in Lords Mobile look pretty, but in reality, the result of the conflict is already decided at the beginning according to troop types of both sides. The scene you are watching is just for entertainment – the game already calculated which side will lose according to the battle mechanics we described above. In this regard, we highly advise you to use the “scout” option before going into battle or defense. By using this option, you can learn which types of troops your opponent has and arrange your own army. For example, if your opponent has lots of infantry troops, you can add more cavalry units to your own army. “Scout” option is also the way of determining which troops are best for attacking. 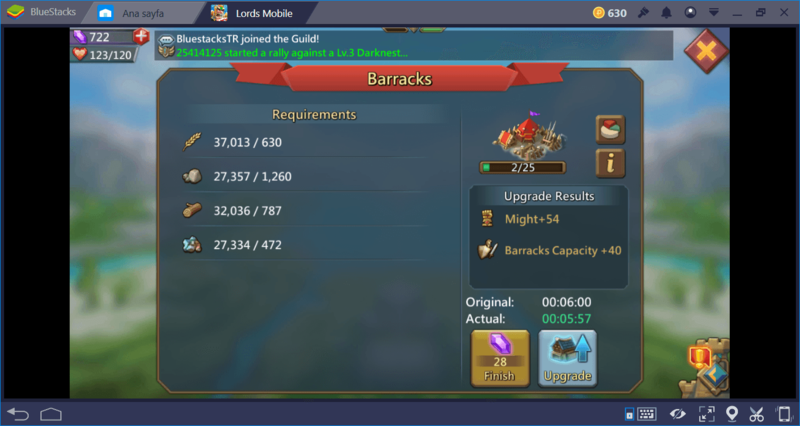 There is no single troop type that is “best” at everything. 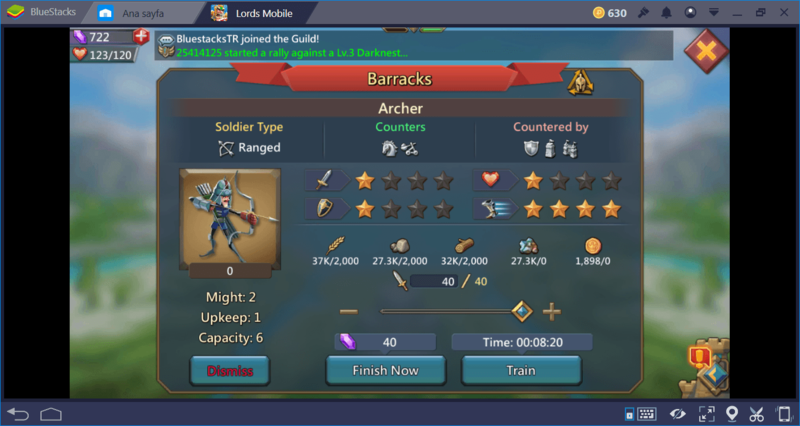 As the attacker, you have the option of forming a balanced army (that contains all troop types) and a focused army (that contains a single troop type). As a general rule, forming a focused army is always the best option. This is because the defending army will always be balanced. If you arrange a balanced army too, each side will have a counterpart in their armies. In other words, you will be evenly matched. 1/3 of your army will suffer a penalty because they will have a counterpart. Only 1/3 of your army will gain a bonus. (The remaining 1/3 will get no bonus or penalties.) In short, you will get no significant advantage. Moreover, your battle boosts will be limited. When it comes to defense, building a balanced army is the better option. Again, there is no single troop type that is best for defense: Your goal should be forming an army that contains all type of troops. However, do not spend resources for Siege troops as they are weak against all other types. Your defending army should consist of a healthy balance of Infantry, Ranged, and Cavalry troops. Yes, an attacker that uses a single type of troop will still have an advantage but forming a balanced defending force is still your best option. If you form your army only with, for example, Archers, the attacker will gain a much bigger advantage if he fills his own army with Infantry. As the defender, you still have an advantage: You can host an unlimited number of troops while the attacker is limited in numbers. To sum it up, whether you are attacking or defending, there is no such thing as the “best” troop that can respond to every need. You must analyze the battle ahead and form your army according to that evaluation.